All swap meet spaces are ONE LOW PRICE. 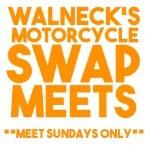 All Swap Meets will have American, British, Japanese, Euro, Dirt Bikes, parts, used and new, Leather, Patches & Sewing,T-Shirts and all kinds of bikes and what-nots for sale; including motorcycle posters. Call us to register at (630) 985-2097 INDOOR SPACES MUST BE PREPAID. Still ONE LOW PRICE for all spaces. $40 for Each 10 x 10 Indoors. Outdoors is $40 for all the room you need!